This issue brief first presents data on the chronic underinvestment in schools since the Great Recession. It then explores research demonstrating that investment in K-12 education benefits students, as well as research on the impact that underinvestment is having on schools’ most important resources—teachers and students. Finally, the brief discusses how state and federal policymakers can prioritize this issue. On average, 47 percent of K-12 education funding comes from state revenue, while local government provides 45 percent, and the federal government provides the remaining 8 percent.4 Because schools depend on state funding for about half of their revenue, they must drastically cut spending when states provide less—especially when local districts cannot cover the gap. 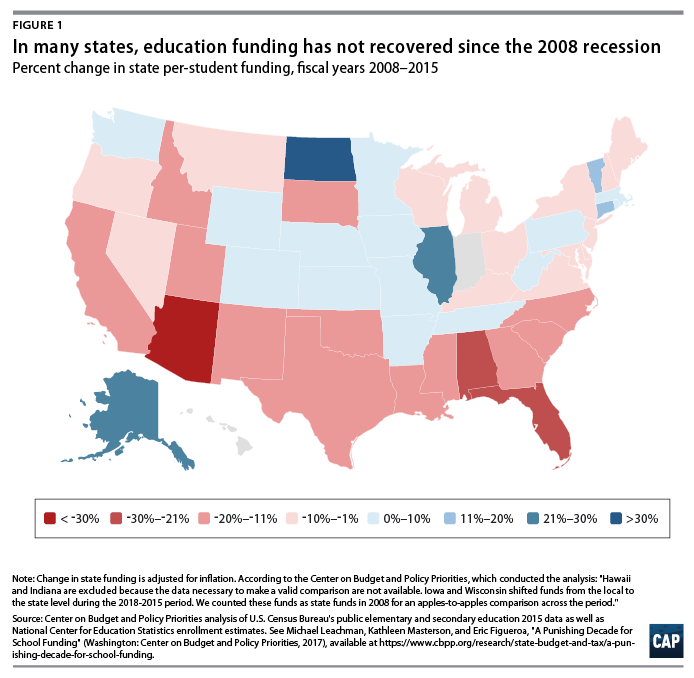 Over the past decade, states with the steepest funding declines have seen one-fifth of state education funding vanish. Some of these cuts, particularly those made immediately following the recession, were a result of economic forces outside of states’ control. Once revenue began to rebound, however, many states enacted massive tax cuts that deprived state governments of revenue needed to increase education spending. 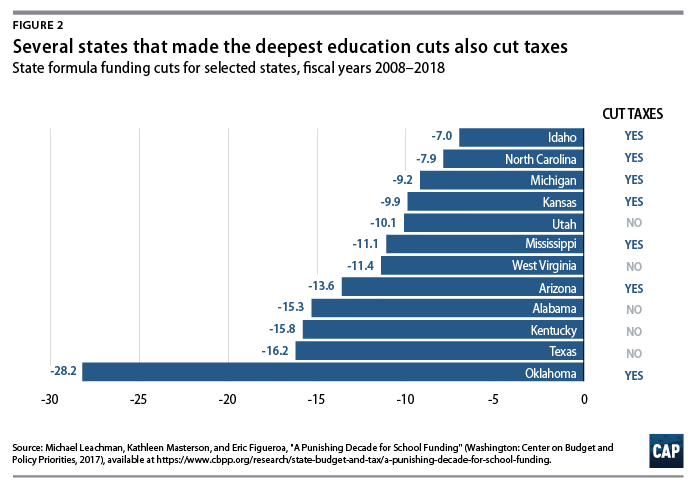 In recent years, seven of the 12 states that have made the deepest funding cuts since 2008 chose to cut taxes rather than reinvest in education: Arizona, Idaho, Kansas, Michigan, Mississippi, North Carolina, and Oklahoma.5 Notably, in spring 2018, three of these seven states—Arizona, Oklahoma, and North Carolina—experienced teacher walkouts in protest of insufficient education funding and low teacher salaries. The first state to have a walkout, West Virginia, had not made tax cuts but still had some of the deepest funding cuts in the nation. For years, some policymakers and conservative education advocates have argued that spending more money on education does not necessarily improve results—and they have used this claim as an excuse to cut funding.8 Recently, however, more and more evidence is casting serious doubt on this position. Indeed, money matters a great deal, particularly for students from low-income families. Historical increases in education spending—especially during the 1990s, when many states changed their school finance formulas—are associated with improved educational outcomes. A study on the effect of court-ordered increases on per-pupil spending, for example, found a positive correlation with student graduation rates.9 Court-mandated reforms tended to increase spending in higher-poverty districts and allocate more resources to districts based on observable indicators of student need, such as free lunch eligibility and the enrollment of students of color. Similarly, research indicates that greater state spending on low-income students leads to improvements in student learning in reading and math.10 One 2018 study connected state funding reforms to National Assessment of Educational Progress (NAEP) data in low-income school districts between 1990 and 2011. It found that the NAEP test score gap decreased in states that passed school finance reforms to make funding more equitable but remained the same in states that did not. Additional research points to the impact of education spending on students’ future earnings. Research examining the relationship across districts between per capita income and per-pupil expenditures on students who are now adults and earning income found a correlation between improving school finance equity and the intergenerational income mobility of low-income students.15 The study also explored how equalizing revenue is associated with reduced disparities across high- and low-income districts, including disparities in teacher-to-student ratios. A recent study quantified this intergenerational mobility effect, finding that a 10 percent increase in per-student spending was associated with an increase in low-income students’ adult wages by about 7 percent, as well as a 3 percent lower poverty rate.16 Both this and the earlier study found correlations between specific inputs that were made possible through increased funding—such as raising teacher salaries and lengthening the school day—and student achievement. Cuts to education spending affect all aspects of students’ academic experience, from the condition of the school building to the courses offered and the teachers in the classroom. In fact, teacher salaries and benefits account for the majority of public school spending. As of 2015, salaries and benefits accounted for about 80 percent of per-pupil expenditures—including the salaries and benefits of teachers, administrators, and other staff.17 It is not surprising, then, that in this decade of brutal cuts to education funding, teachers are feeling the squeeze. Teacher salaries have been stagnant for the last 20 years. In fact, from 1996 to 2015, the average weekly wages of public sector teachers decreased $30 per week, from $1,122 to $1,092 in 2015 dollars.18 During this same time period, the weekly wages of all college graduates rose from $1,292 to $1,416. As a result, teachers’ weekly earnings are now 23 percent lower than those of other college graduates. Studies demonstrate that there is a link between teacher pay and student outcomes. 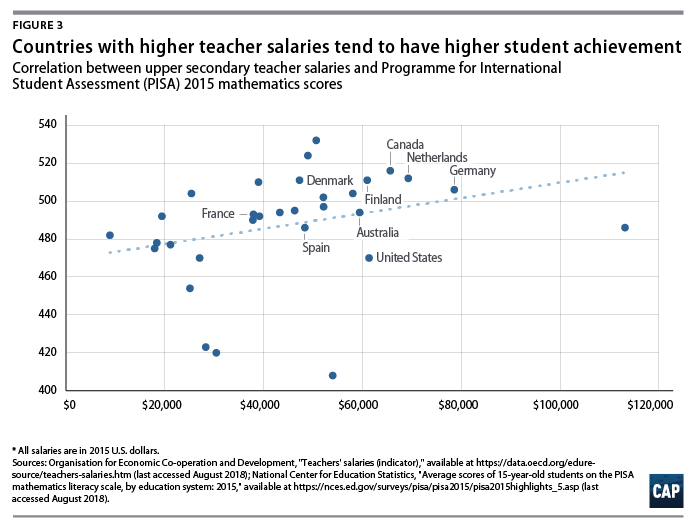 A 2011 study comparing teacher pay and student outcomes theorized that paying teachers a higher wage attracts new teachers, which promotes competition and, in turn, higher-quality applicants.24 The researchers found a correlation between higher pay and student performance across countries. Figure 3 illustrates a similar correlation. In addition to providing resources for higher teacher pay, there is a range of ways in which greater spending is likely to positively affect student achievement. Poor school conditions, for instance, can have negative effects on student learning. 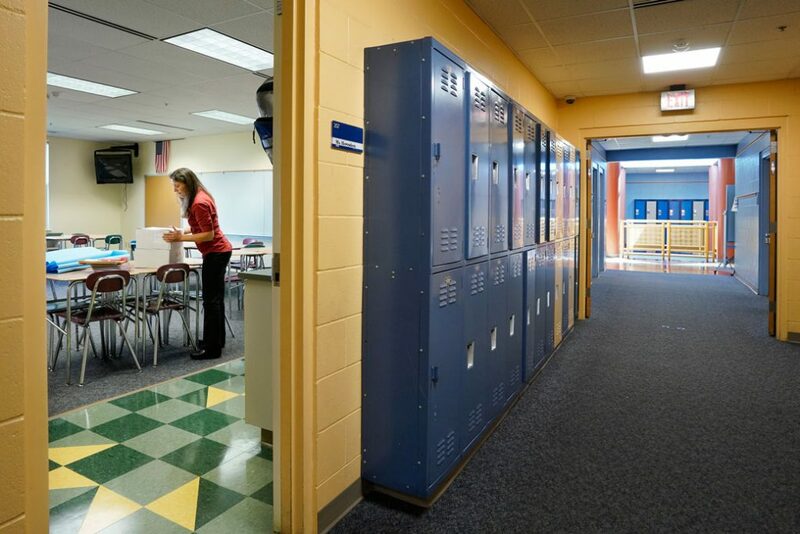 Research indicates that poor air quality or lighting, uncomfortable temperatures, and excessive noise can all impede student learning.28 A study of New York City middle schools found that, among other aspects of the physical and social environments, the building condition was a contributing factor to academic performance.29 Every student should be able to learn in a safe and comfortable environment. But more than half of U.S. public schools are in need of repairs.30 The U.S. Department of Education estimates that deferred maintenance and repairs alone would cost about $200 billion.31 Investing in crumbling school buildings and updating facilities would indicate that communities value student learning. In addition, specialized pupil support services personnel, such as school psychologists and social workers, help to reduce many of the barriers that hinder student success. Mental health and behavioral issues—including delinquency, attention difficulties, and substance abuse—are significantly associated with lower achievement.35 Research indicates that psychological distress and depression may increase the likelihood of homework trouble, absenteeism, and course failure.36 Likewise, experiencing trauma such as violence or abuse is associated with lower standardized test scores, not just for the students who experience trauma but also for their classmates.37 Nevertheless, many students’ mental health needs go unmet, as school-based mental health professionals are operating far below recommended ratios.38 Investing in additional specialized pupil support services personnel can address student needs that interfere with learning. Since the Great Recession, many states have systematically disinvested in education. This has affected all aspects of school quality, from teachers to school environment to instructional materials used in the classroom. By underfunding schools year after year, too many states are doing a great disservice to their students—and they are potentially harming the nation’s long-term economic potential. States should increase funding for K-12 public schools. In addition, the federal government can play a role in investing in teacher pay, first, by rejecting administration efforts to cut funding and, then, by expanding existing funding streams. It can also bring forward any of a number of proposals to improve teacher compensation that have recently been introduced in Congress.41 If education is truly to be an engine of opportunity and economic mobility, states and the federal government must invest far more in the communities that need resources most. Lisette Partelow is the director of K-12 Strategic Initiatives at the Center for American Progress. Sarah Shapiro is a former research assistant for K-12 Education at the Center. Abel McDaniels is a former research associate for K-12 Education at the Center. Catherine Brown is the vice president of Education Policy at the Center.